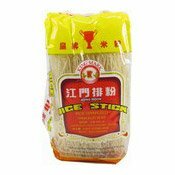 Kong Moon Rice Stick Noodles are an ideal alternative to wheat noodles. Light and soft in texture when boiled or crunchy when deep fried. The noodles take on the rich flavour of sauces, braised meats and soup stock. 1. Stir Fry: In a deep bowl or pan cover vermicelli with boiling water and stand for 10 minutes, drain well. Add to cooked meat and vegetables and stir fry for a further 2 minutes. 2. Deep Fried: Cut the required amount of vermicelli into 3 inch lengths (noodles will expand in hot oil). Heat 3 cups of oil in a wok. Add a handful of noodles. Be quick to remove (to prevent burning) and drain on absorbent paper. Use as a substitute for steamed rice or instant noodles. 3. Soup Noodles: Simply add the required amount of vermicelli to boiling stock and cook for 3-4 minutes or until desired texture. A lighter alternative for favourites such as Laksa noodles. Ingredients: 200g gold Pearl Rice Vermicelli, 1 tsp canola oil, 1 clove garlic crushed, 1 tsp curry powder, 1 tsp fresh ginger minced, 1 cup celery sliced thinly, 1 small carrot, 100g char siu pork, 1 tsp soy sauce, 1 boiled egg and spring onion for garnish. 1. Cook noodles in boiling water with 1 tsp of oil for 3 minutes. 2. Place celery and carrots in bowl and cover with boiling water. Stand for 3 minutes. Drain and set aside. 3. Heat oil in wok and add garlic, ginger and curry powder, stir fry for 1 minute. 4. Add celery, carrots and char siu pork, stir fry 2 minutes. 5. Add noodles and soy sauce. Stir fry for 2 minutes. Serve garnished with egg and spring onion. Ingredients: Rice Flour (95%), Water. 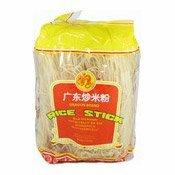 Simply enter your details below and we will send you an e-mail when “Kong Moon Rice Stick (Vermicelli Noodles) (冮門排粉)” is back in stock!